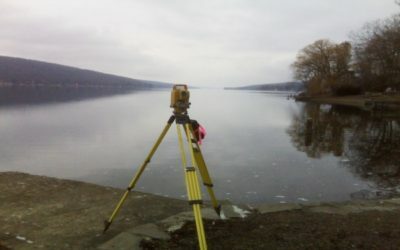 Since 1998, Larson & Simolo Land Surveyors has been providing professional land surveying throughout the Finger Lakes Region of New York State. With the combined experience of over 60 years, Ken Larson and Dave Simolo take pride in the quality of their work. 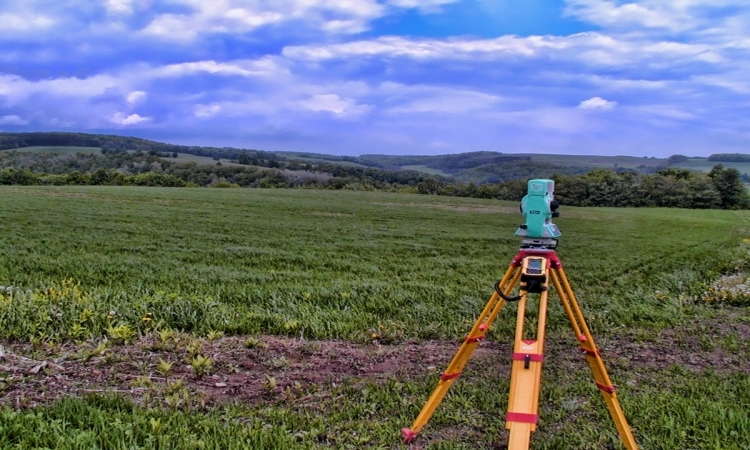 A licensed, professional land surveyor is present at every project. Service is completed in an accurate, timely manner. 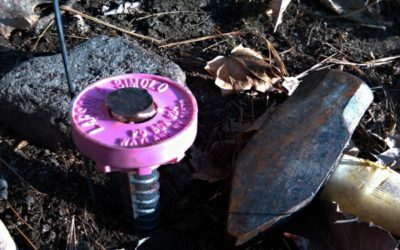 Larson & Simolo Land Surveyors provides the experienced, courteous and professional service that your project deserves. 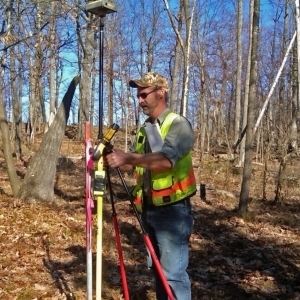 Dave Simolo has been a licensed, registered New York State Professional Land Surveyor since 1998. With over 28 years of experience in the land surveying field and extensive experience in land development, construction and business, he has worked as a licensed New York State Real Estate Agent and New York State Fire Prevention and Building Code Officer. 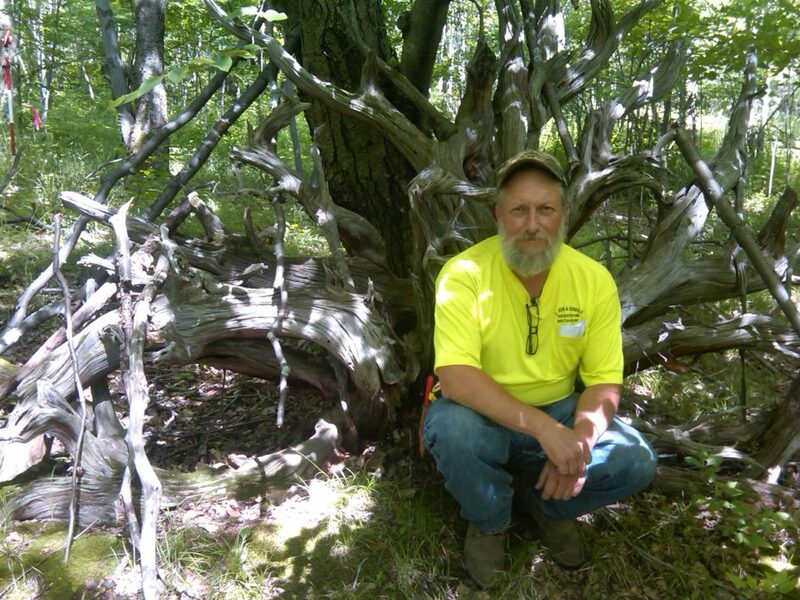 Dave is a member of the New York State Association of Professional Land Surveyors and a Notary Public. 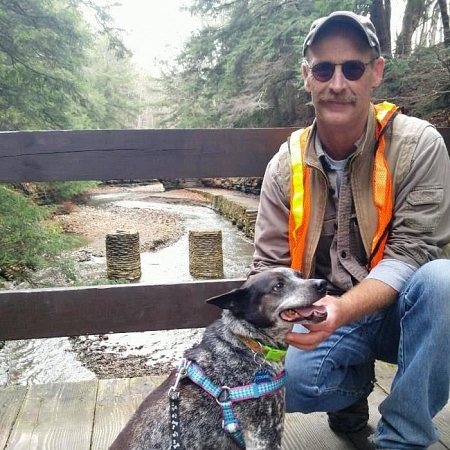 Dave is active in the community and serves as Cohocton Town Councilman and as a Cohocton Historical Society Trustee. Ken Larson has been a licensed, registered New York State Professional Land Surveyor since 1998 with over 32 years of experience in the land surveying field. 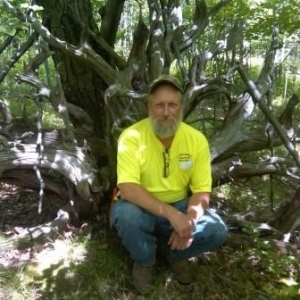 Ken is a graduate of the New York State College of Environmental Science and Forestry School at Wanakena, New York and is a member of the New York State Association of Professional Land Surveyors. Boundary Survey – Determines the boundary lines of a parcel, establishing the corner documentation and creating a map showing these along with the relevant improvements and features. Logging and Timber Trespass Survey – May include various aspects of the boundary surveys above to facilitate the needs of timber harvesting. Forest Management Survey – Facilitating boundary information for proper management of forest lands including 480A Tax Plans that require property line marking and mapping of the affected wooded areas. Line Posting – Generally includes the determination of boundary lines and marking them so that they can be properly identified at all times. 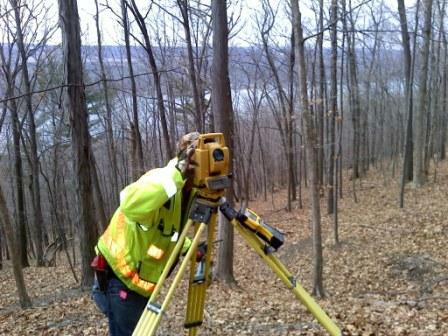 Topographical Survey – Determines the elevations and features on the ground that are relevant for the client’s needs. Elevation Certificate, LOMC, LOMA and eLOMA – This involves the gathering of data and completing the necessary forms relating to flood insurance under FEMA Flood Insurance Rate Program. 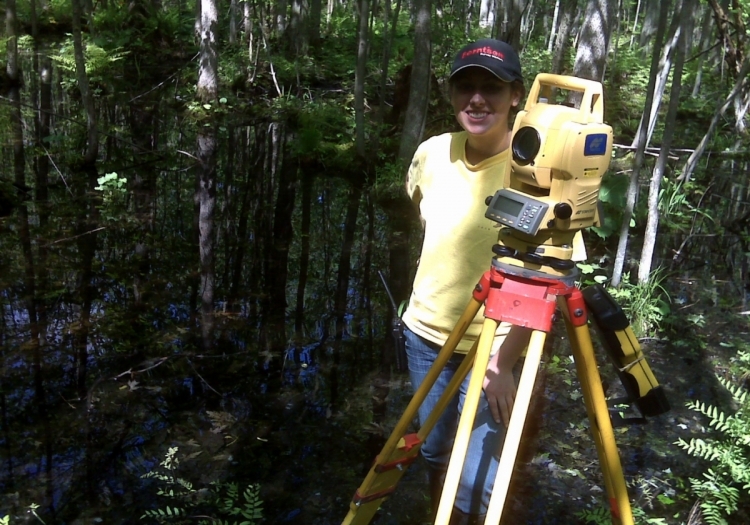 Littoral (Lake) Rights – These surveys involve working with a client’s property adjoining a lake. Determination of the mean high water line and other features may be necessary for construction and/or permit approval for upland projects, docks and moorings. 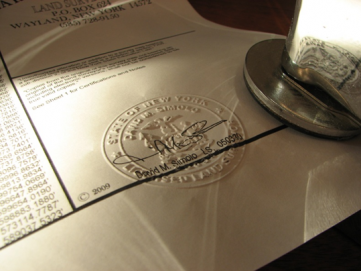 American Land Title Association (ALTA) Survey Work – Surveys for commercial projects often require national standards for appropriate title review. Global Positioning System (GPS) Satellite Work – GPS equipment utilized in our various projects can provide types of reference networks to clients who may require this information. Geographical Information Systems (GIS) Work – Larson & Simolo Land Surveyors acquire data through various sources to create maps based on our client requirements. This information is often included with aerial photo images that don’t require precise boundaries. Larson & Simolo Land Surveyors provide surveys for real estate agents, foresters, loggers, attorneys, contractors, land conservation organizations, government agencies and land trusts. Services are available for both commercial and residential properties, year-round. Whether other people are entitled to partial use of your property through easements for utilities or rights-of-way. Your survey thus gives you a form of protection in addition to clarifying what you’ve bought, since it will reveal any encroachments or other irregularities that might be the cause of later legal disputes. In addition, your surveyor can mark the exact corners of your site with survey monuments. Larson & Simolo Land Surveyors can provide an Elevation Certificate for your insurance agent or gather the data and complete the necessary forms for a LOMC, LOMA or eLoma application so you can possibly be released from the requirement to carry flood insurance. You need to protect your investment by making sure you are building on your own property. A mislocated fence, driveway or carport can cause legal problems and extra construction costs. 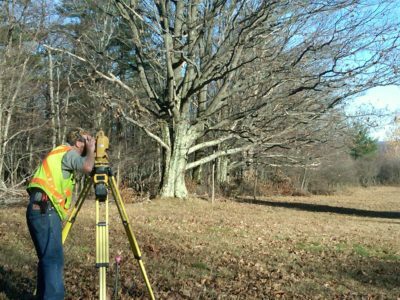 Before you build, let a licensed land surveyor determine your property boundaries, replacing missing stakes if necessary. Allowing a surveyor to mark the location of your building on site before construction begins will also ensure that you meet setback requirements and other restrictions enforced by the municipality in their zoning laws. Failure to comply with zoning laws could result in the loss of a future sale if the purchasers have an up-to-date survey done. Mortgage lenders generally do not advance money until zoning law infringements are cleared up. A mortgage company, whether it is a bank, trust company or others, usually requires a survey before they will lend money. Why is this a necessity and why are you often asked for an up-to-date survey? Do the lot size, building setbacks, pool and fence locations meet with local Zoning Laws? The mortgage company will require the survey to protect their investment. They want to be sure that the land and buildings on which they are lending money are as described in the documents which accompany the transaction. They also wish to know that if they have to foreclose there will be no problems in re-selling the property. According to New York State law, only surveys made by licensed and registered New York Land Surveyors are legal. Only registered Land Surveyors have completed the academic requirements and practical training before licensing. Only registered Land Surveyors are required to maintain the necessary theoretical, practical and ethical standards set by legislation. Depending on the nature and extent of the work, anywhere from a few hundred to several thousand dollars. Fees for surveys are determined on an individual basis, depending mainly on the amount of time required for the research and the survey. Prior to engaging your surveyor, you may wish to inquire of the likely estimate of the fees that the survey will entail, along with the expected completion date. 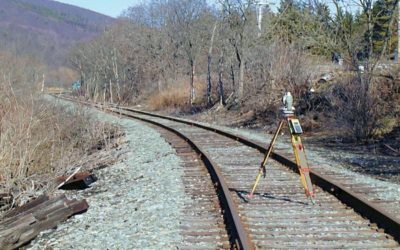 In cases of dispute, your surveyor is an expert witness in court and assumes full professional responsibility for the accuracy of your survey. The cost of the survey as a percentage of your total investment is small and a reasonable price to pay for peace of mind. Typically your house and land represent your largest assets. If you are contemplating purchasing property, you should know as much as possible about the piece of land in which you are going to invest. Obtaining a survey may be the most important thing you do before you close the deal on any purchase. Without a survey, you do not know the extent of your property, as only a licensed surveyor can provide you with this information. Without the survey, there is too much you do not know and you are risking both friendly neighbors and your investment. It pays to know the boundaries of your land. A small distance can make a big difference. The erection of a fence can be the source of expensive litigation and ill will between neighbors. Your licensed land surveyor can help you avoid disputes. Larson & Simolo Land Surveyors were the project surveyors for the Cohocton Wind Farm which was an ALTA survey that encompassed an area 11 miles long north-south by 6 miles long east-west. Larson & Simolo Land Surveyors utilized 23 people on this project in order to meet the demanding scope and timetable. Larson & Simolo Land Surveyors were able to provide landowner liaison, notary services, public records research, a GPS based survey control and monument network, boundary survey analysis, site plan input and implementation, lease parcel configurations, legal descriptions, lease map attachments,microwave path locations, railroad locations, utility locations, pipe line locations, gas line locations, interstate highway determinations, wetlands staking, archeological site staking, turbine siting parameters, setback compliance, stakeout for construction, asbuilt locations and a 17 page ALTA survey paper and electronic map product suitable for planning, constructing, verifying and financing this ¼ billion dollar project. 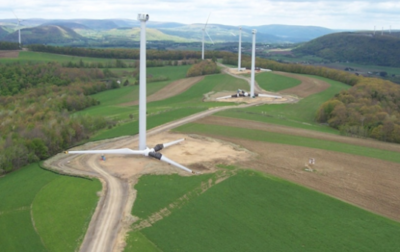 Our technology and expertise has also been utilized on other wind farm projects in the area. 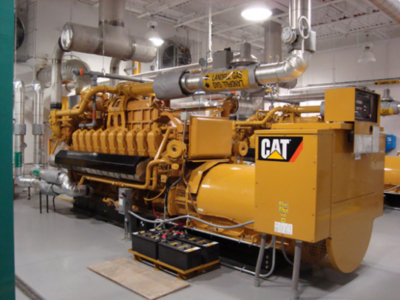 Larson & Simolo Land Surveyors also provided stakeout work for the Steuben County landfill’s co-generation project that utilizes landfill-produced methane gas to generate electricity. Larson & Simolo Land Surveyors have provided local governments with highway relocation mapping and staking so that roads can be improved to benefit the adjoining property owners and the public flow of traffic. Layout of large commercial structures and supporting utilities and other features has been provided by us to both private and governmental entities. Sometimes precise locations are not the goal. Instead Larson & Simolo Land Surveyors have delivered GIS information to the client in order to allow them to satisfy their needs for large scale information. Larson & Simolo Land Surveyors welcome the opportunity to discuss your project needs with you.